Michael W. Adamowicz, LICSW Editor: Patrick Condron, M.Sc., MAC, CAS, ADC. Is Cocaine Rehab Aftercare Necessary? What is Cocaine Rehab Aftercare? The concept of aftercare describes the structured, ongoing management of substance abuse recovery following a period of formal treatment - be it inpatient, residential or outpatient. The primary goal of aftercare programs is to teach an individual the skills to persistently cope with environmental cues related to addiction and respond without relapsing to active use. Aftercare--the ongoing management of substance abuse recovery after formal treatment--is essential because cocaine addiction is a 'chronic relapsing' disorder. However, like other chronic illnesses such as diabetes or asthma, recovery from cocaine addiction is highly manageable with long-lasting periods of abstinence through aftercare. Brain adaptations to cocaine abuse can last a lifetime, so individuals are encouraged to maintain the goals that have been achieved in treatment to prevent relapse. If you continue to struggle after treatment, help is available by calling 1-888-993-3112Who Answers?. Our treatment support specialists can help you evaluate the need for continued treatment and/or provide more information about aftercare programs for you. Relapse prevention involves altering behavior so that high-risk situations are avoided and learning how to respond when these situations are inevitably encountered. In relapse prevention groups, an addict can address his/her fears of relapse, paying attention to the feedback received from peers. Relapse prevention is especially recommended in cocaine dependence because the major causes of relapse with cocaine are cravings, stressful conditions, and drug-associated environmental cues. It is paramount to learn the skills needed to cope with these triggers. Relapse prevention has been successful in cocaine-addicted individuals whose depression persists after treatment, a sub-group that usually has poor outcomes and high relapse rates after treatment completion. A disruption in brain reward mechanisms. The inability to abstain consistently (from the drug). Severe craving, particularly during withdrawal. Diminished recognition of significant problems with one's behavior and interpersonal relations. Unfortunately, addiction is often dealt with as an acute illness that is expected to pass, unlike chronic illnesses, where relapse is ubiquitous and anticipated. This approach only serves to enforce the notion that addiction is a social problem requiring interdiction and law enforcement, rather than a health problem requiring prevention and treatment. When you, or someone you know and care about, finished cocaine addiction treatment, there is an enormous empty space in their lives, left by the absence of the drug. Recovery is not about getting it right first time, it is about learning, even through relapse, to continue lifestyle changes, to establish supportive relationships, and create appropriate boundaries that can help enhance abstinence and positive outcomes. Recovery is a journey, and if you continue to struggle with cocaine addiction, call us at 1-888-993-3112Who Answers? to hear about treatment options that will assist the journey to good health. Continuing care refers to treatment programs that cater to individuals after the completion of treatment. Most of these continuing care/aftercare programs consist of counseling, outpatient support groups, and participation in supportive 12-Step programs such as Narcotics Anonymous (NA) or Cocaine Anonymous (CA). CBT was found to be highly effective in decreasing cocaine craving and use, as measured by self-reported outcomes after 90 days of treatment. CBT teaches individuals how to recognize and change old patterns of thinking and behaving, and replace them with new behaviors, which not only break the cycle of addiction but also address the underlying issues involved in the addictive cycle. It is effective in individual and group settings. This therapy is based on the premise that everyone in the addicted person's life is affected by the addiction. Treatment of one family member should include the entire family, helping them with issues of co-dependence/enabling of the addicted member, and increasing client compliance. This therapy plays a major part in recovery from addiction. Group counseling instills hope in individuals struggling with addiction by providing the companionship of others who are in the same situation. Individuals are also able to better learn and maintain coping behaviors through peer interaction and modeling. Spirituality is frequently cited as a major contributing factor to recovery, usually mediated through Twelve-Step programs. These fellowships/programs assert the necessity of finding a power greater than ourselves to overcome addiction, and sharing the message with others as a result of a "spiritual awakening" (Alcoholics Anonymous). The program follows a sponsorship model, where an individual struggling with addiction is able to find support from someone who has experienced the same situation. While it is not well-defined in the peer-reviewed studies, the "spiritual awakening" aspect of Twelve-Step participation has been cited in the research as predicting improved outcomes, with longer periods of abstinence, adding to the anecdotal evidence that Twelve-Step programs can be beneficial. There is no FDA-approved treatment for cocaine dependence. Since dopamine (DA) plays a big role in cocaine's mechanism of action, medications aimed at addressing the potential dopamine depletion of cocaine withdrawal are those which exert dopaminergic activity, thereby reducing cocaine cravings, e.g. Amantadine (Symmetrel (R)). Other medications target GABA reuptake that is known to affect DA activity in the brain, e.g. baclofen (Gablofen (R)) or tiagabine (Gabatril (R)). Testing of a cocaine vaccine has shown that cocaine antibodies prevent cocaine molecules crossing the blood-brain barrier (BBB), blocking cocaine's effects in the brain. Preliminary research shows promise in addicts who are highly motivated towards recovery. Further randomized clinical trials are necessary to fully understand long-term efficacy and immunological responses. Since many cocaine addicts struggle with co-occurring major depressive disorder, the use of antidepressants such as fluoxetine (Prozac (R)), nefazadone (Serzone (R)) and citalopram (Celexa (R)) has shown significant retention in treatment and reduction in cocaine use. Additionally, treating underlying depression in cocaine addiction has been demonstrated to improve treatment outcomes. Who are susceptible to ischemic or hemorrhagic stroke due to heavy cocaine abuse. Contingency Management (CM) is defined as the positive reinforcement of desirable behaviors, specifically negative drug screens, during treatment. Vouchers, which have varying degrees of retail value, are awarded for abstinence. Abstinence is usually measured by urinalysis. A multi-study analysis of CM has demonstrated that, of all the behavioral studies for cocaine dependence, CM has shown the strongest efficacy in treating cocaine addiction, with one study showing a 73% abstinence rate in the first 2 months of treatment. The effects of CM seem to be enhanced by pharmacotherapy, particularly with antidepressants like bupropion and desipramine; however, more research is required to delineate the magnitude of this correlation. Sober living communities, sometimes referred to as halfway houses, typically receive patients who are not ready for independent living, who do not have a safe home to return to, or who need the support of an environment conducive to recovery. Research studies indicate that life skills training, 12-Step groups, and enhancement of supportive relationships made for healthier coping strategies and decreased drug use. Sober living options focus on these life skills to allow better reintegration into society after the struggle of addiction is managed. Therapeutic communities particularly benefit those struggling with the highest severity of addiction, social deviancy, and psychological problems. Studies of populations that have severe use profiles have demonstrated that therapeutic communities can help in reducing drug use and criminality; increase rates of employment and prosocial behaviors. Family members are critical to the strength and duration of the client's recovery. Both the individual struggling with addiction and their families/friends can benefit from attendance at group meetings set up by many agencies. Group-support meetings can enhance relationships by improving communication and reducing stress in families. 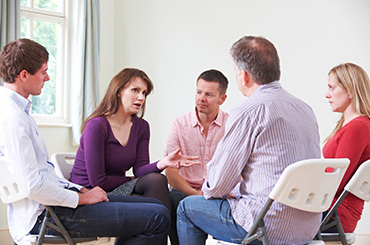 One of the reasons for the improvement in relationships is that these meetings give family members the opportunity to learn more about addiction and co-occurring issues. They are able to accurately alter their expectations and learn how to deal with their family members. Family members and friends are the individuals who were part of a person's life before treatment and will continue be part their recovery after treatment. Ongoing family therapy helps ensure that family functioning and relationships adjust to, and positively influence, the recovery of the individual struggling with cocaine addiction. If you are a friend or family member of someone struggling with this problem and want to find out more about how you can become involved in cocaine aftercare and relapse prevention, please call to speak with a caring treatment support team member at 1-888-993-3112Who Answers? today. 1976. Alcoholics Anonymous. Third Edition. New York City: Alcoholics Anonymous World Services, Inc.
Ciraulo, D.A., et al. (2005). Nefazadone treatment of cocaine dependence with comorbid depressive symptoms. Addiction 100(Suppl. 1): 23-31. Gingrich, S., and Mueser, K.T. (2011). Illness Management and Recovery: Personalized Skills and Strategies for Those with Mental Illness. Implementation Guide. Dartmouth PRC/Hazelden. James, R.K. (2008). Crisis Intervention Strategies.Sixth Edition. Belmont, CA: Brooks/Cole. Julien, R., et al. (2011). A Primer of Drug Addiction. Twelfth Edition. New York, NY: Worth Publishers. Kosten, T. R., et al. (2014). Vaccine for Cocaine Dependence: A Randomized Double-Blind Placebo-Controlled Efficacy Trial. Drug Alcohol Depend 140:42-47. McKay, J.R., et al. (2013). Factors in Sustained Recovery from Cocaine Dependence. J Subst Abuse Treat 45(2):163-172. Moeller, F.G., et al. (2007). Citalopram Combined with Behavioral Therapy Reduces Cocaine Use: A Double-Blind, Placebo-Controlled Trial. The American Journal of Drug and Alcohol Abuse 33: 367-378. Mooney, M.E., Schmitz, J.M., Moeller, F.G., and Grabowski, J. (2007). Safety, tolerability and efficacy of levodopa-carbidopa treatment for cocaine dependence: Two double-blind, randomized, clinical trials. Drug and Alcohol Dependence 88: 214-223. Neslter E.J., (2004). Historical Review: Molecular and Cellular Mechanisms of Opiate and Cocaine Addiction. TRENDS in Pharmacological Sciences 25(4): 210-218. Paczynski, R.P., and Gold, M.S. (2011). Chapter 14: Cocaine and Crack. In Ruiz, P., and Strain, E., eds. Lowinson and Ruiz's Substance Abuse: A Comprehensive Textbook, 5th Edition. Philadelphia: Lippincott, Williams & Wilkins. Schmitz, J.M., Averill, P., Stotts, A.L., Moeller, F.G., Rhoades, H.M., and Grabowski, J. (2001). Fluoxetine treatment of cocaine-dependent patients with major depressive disorder. Drug and Alchol Dependence 63: 207-214. Schmitz, J.M., Mooney, M.E., Moeller, F.G., Stotts, A.L., Green, C., and Grabowski, J. (2008). Levodopa pharamacotherapy for cocaine dependence: Choosing the optimal behavioral therapy platform. Drug and Alcohol Dependence 94: 142-150. Strobe, S., et al., (2013). Spiritual Awakening Predicts Improved Drinking Outcomes in a Polish Treatment Sample. Journal of Addictions Nursing 24(4):209-216. Stulz, N. et al., (2011). Psychosocial Treatments for Cocaine Dependence: The Role of Depressive Symptoms. Drug Alcohol Depend 114(1):41-48. Vocci, F. J., & Montoya, I. D. (2009). Psychological treatments for stimulant misuse, comparing and contrasting those for amphetamine dependence and those for cocaine dependence. Current Opinion in Psychiatry, 22(3), 263-268. Walton-Moss, B., et al. (2013). Relationship of Spirituality or Religion to Recovery from Substance Abuse. Journal of Addictions Nursing 24(4):217-226. Winhusen, T., et al. (2007). A double-blind, placebo-controlled trial of tiagabine for the treatment of cocaine dependence. Drug and Alcohol Dependence 91: 141-148.